In India, it was nothing for me to put my Nicaraguan finger wave right in people's faces, and even less to look someone in the eye and say, "DON'T LOOK AT ME". It's been a little strange to come to Japan, the land of polite. I've been marveling at the marked contrast between the two countries. While at the Hiroshima museum, for example, I was looking at a display case in which a pocket watch and belt buckle were kept. I was cornered by a man in an official green vest who approached and asked me in very broken English if I was from Australia. I shook my head and said "America." I was annoyed and skeptical and so I didnt really make eye contact. I kept waiting for the proverbial other shoe to drop, however I had no choice but to let him hand me the headphones attached to an ancient FF-only cassette tape player. I should have finger waved him and marched past. But it was too late and I waited forever as he pressed Play, then waited some more as he realized the tape needed to be flipped and then flipped the tape over and adjusted the volume and then pressed Play again. "Hello." it began, in an American voice. "I am [so-and-so], and I am helping to tell the story of Minoru Hataguchi". The tape continued. Minoru donated the pocket watch and belt buckle to the museum. They belonged to his father, who was just 31 on August 6, 1945 at 8:15am when the bomb hit. When his mother, 29 didn't hear from her husband for four days, she travelled into the city to the train station where his father worked. She rifled through the ashes and found the pocket watch and belt buckle under an overturned safe. She gathered a few bones and some ashes she found nearby and brought them home with her. She was pregnant at the time, and so Minoru is a confirmed Hiroshima survivor. I still didn't look at him. Was he going to ask for money? The tape concluded. Minoru removed a laser pointer from his pocket and showed me on the map how far his mother had to walk to the train station, and also how far the train station was from the epicenter (1.7 kilometers). I finally looked him in the eye. He smiled. I smiled. He just wanted to share his story. Embarrassed, all I could muster up was to quietly say "thank you" to Minoru and walk away. I started crying and didn't stop until I left the museum. Thanks a lot, India. You've really made a wonderful person out of me. The box contains the names of all of the victims. In the background, an eternal flame burns. It will continue to burn until all nuclear arms are destroyed. 140,000 people died by Year's end 1945. People just like you and me. Three days after Hiroshima, the US dropped a second nuclear bomb on Nagasaki and killed an additional 150,000, half of which died immediately and the other half later from injuries sustained. The US, France, Russia, and The UK are still testing nuclear arms on a regular basis. 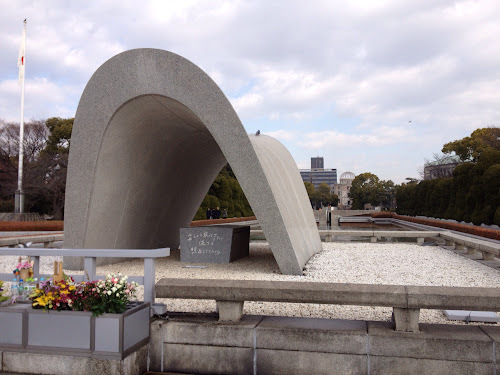 The mayors of Hiroshima since 1968 have sent letters of protest each and every time they are made aware of a nuclear arms test, a copy of each hangs in the Peace Memorial Museum. 559 letters have been sent to date. Oh, and a google search informed me that Minoru Hataguchi is the director of the Peace Memorial Museum. The world is insane. the U.S. thinks they are the good guys. I've been to the atomic bomb museum a few times (I live across the Inland Sea) and it never fails to make me cry. And that's without being approached by a genuine survivor. Although, I've been here long enough to never assume someone wants money, which is interesting when I return to the UK. How to Stay Warm in India?